Day surgery operating theatres are only being used for an average of 16 hours a week, a report has found. The Healthcare Commission found 45% of the theatre time in England allocated for day surgery was going to waste. It put the blame on cancelled operations, late starts, and excessive delays between operations. The commission said using day surgery more efficiently could reduce pressure on ward beds, bring down waiting lists and improve care for patients. Its report found at least an extra 74,000 patients a year could have day surgery, rather than be admitted as inpatients, if the least efficient units started employing the practices of the best. This would release inpatient beds for operations on other patients. The report follows a warning from Health Secretary Patricia Hewitt that high levels of investment in the NHS will not continue indefinitely - and that efficiency savings must be made. Anna Walker, chief executive of the Healthcare Commission, said: "When patients stay overnight for something which could be done in a single day, patients are inconvenienced and resources are wasted. "NHS trusts need to investigate why more day surgery is not being done and do all that they can to reduce cancellations." The Healthcare Commission will discuss its findings with individual trusts. The report, which examined 313 day surgery units in England, found one in 10 cancelled more than a third of the available operating theatre sessions and many patients had their operations cancelled at short notice. Staff numbers in day surgery units were found to be rising faster than their activity. But in nearly 40% of day surgery units no single consultant was in charge - a factor, the report says, which may be hampering more efficient use of resources. The total number of day surgery admissions for 25 common procedures increased by 12% over the last four years. However, much of this was down to a big increase in cataract surgery. The proportion of day surgery cases for a number of common procedures actually went down. The report said there had been improvements in booking procedures, and in providing patients with information about their operation. A Department of Health spokesman said the NHS Plan, published in 2000, stressed that day surgery was often a good option for patients, who can recover in the comfort of their own homes. "Over the last few years, the NHS Modernisation Agency has worked with the NHS to promote and improve day surgery. "As the Healthcare Commission report shows, there is scope for further improvement. "We will continue to support the NHS in this area, as part of our pledge to ensure that by December 2008, no patient waits more than 18 weeks from GP referral to the start of their treatment." 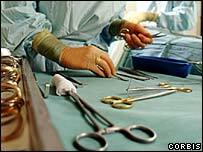 Around 740,000 day surgery operations are performed in England each year. Procedures appropriate for day surgery include hernia repair, tonsillectomies, and removal of ganglions.